Did you know the International Fountain has its own DJ? It’s hard to choose what’s more impressive about Seattle Center’s International Fountain: the water shooting 120 feet into the air or the playlist that seems perfectly timed to those aquatic acrobatics. If you’ve ever wondered who’s behind the grooves that Seattle kids love to scream and splash to, address your thank-you cards to James Whetzel. The Capitol Hill native, former University of Washington ethnomusicology student and current Columbia City resident first started mixing the fountain’s custom weekly sets 15 years ago. Doing the math, that’s roughly 400 playlists. Each has 35–50 tracks, running the gamut from classical to modern. That means Whetzel has diligently curated more than 20,000 songs for an audience he’ll never meet. But he knows you’re out there and he wants your trip to the fountain and Armory (where his playlists also stream) to be memorable. Tip: If you want to tune in from afar to what’s playing at the fountain, you can stream Whetzel’s mixes on Mixcloud. What led you to your role at the International Fountain? Through playing music and producing music events around town, I met the person who was programming the fountain before me. He thought I had the right skills to do the job well, and so here we are! How do you go about creating the fountain playlists? In terms of making a mix, there are three stages. The first stage is the gathering of music. This is an ongoing, continual process. I work a couple other jobs. I listen to music whenever I’m able, noting tracks that I think might be good for the fountain. Also, I’m a musician and I have many musician and music-obsessed friends who know I am always looking for new music [and send me recommendations]. 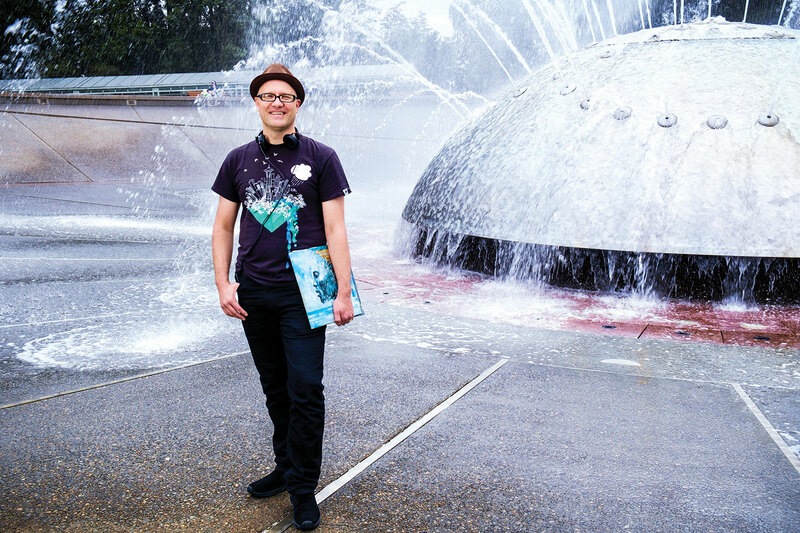 The International Fountain DJ James Whetzel has diligently curated more than 20,000 songs for an audience he’ll never meet. The second stage is assembling the mix. As I am gathering tracks, I put them in folders based on what time of year I think they’ll be good for and on the general mood of the track. I like to make mixes as close to the date that they’ll play as possible because I want to be in the feeling of the moment in Seattle to get music that fits the mood and goes well with our often mercurial weather. The final stage is mastering the completed mix. It takes me about six hours to master a two-hour mix for the fountain. The fountain is such a hot spot for kids. Do you keep them in mind when making your mixes? I most definitely have kids in mind when I make mixes for the fountain! At the start of the year, I play more mellow music, but as things get warmer and sunnier, I know more kids will be coming to play and splash around, so I intentionally pick more upbeat and danceable music. I make sure to keep a playful vibe in all my mixes, but especially after the start of May, you’ll notice the energy level increases. The mixes generally stay pretty high energy from May through the start of September. What’s one thing no one ever asks you about your job but you wish they would? I’d love for people to know is that there are actually two types of music that play at the fountain. There are my mixes, which change every two weeks, and then there are what I call the “big show” mixes. The big show mixes [which are created by various committees tied to specific events] are seven in number, play on a separate system and are what the fountain shoots off the giant blasts of water to. I got to make one in 2006, when I was commissioned to make an international big-show mix to honor the Festál series of festivals. My big-show mix is the one that begins with music by Rachid Taha, and includes remixes I made of DJ Krush, MC Solaar, Soulstance, Manu Chao, Sukshinder Shinda, Fatala, Vela Luka Croatian Dance Ensemble and Hue Traditional Art Troupe, and then finishes with a hip-hop remix that I made of Tito Puente. The big-show programs repeat throughout the year, and play either on the hour or half-hour and generally run for six minutes. Which big-show mixes play at what time is decided by the fountain engineers. And one last thing: During the course of a year of mixes, I do my best to never ever repeat a track. Any misconceptions about Seattle Center that you’d love to correct? Seattle Center deserves more credit for all the cool Seattle things it has incubated. Bumbershoot started as a Seattle Center event (the Mayor’s Art Festival) that became so big, it had to be spun off into a separate entity. Likewise today’s Concerts at the Mural, which for the past few years have been produced by Seattle Center in partnership with KEXP, got their start back at the end of the 1980s as the Sounds of Seattle series. Sounds of Seattle became the original Pain In the Grass series, which was booked by Jeff Gilbert, who was then a DJ for the metal show Brain Pain at KCMU. All of those famous grunge-era concerts of the 1990s at the Mural Amphitheatre were part of Pain In the Grass and were produced by Seattle Center with KXRX and KISW as the radio sponsors.